There are those particularly wonderful friends we have in our lives that, no matter how much time passes, we all just seamlessly pick back up where we left off with them, as though only a day had passed since our last moment of revelling in each other’s glory. 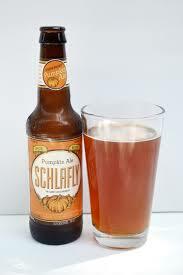 Schlafly’s Pumpkin Ale is that pumpkin beer to me; the pumpkin beer that I call “old friend”, after drinking in it’s annual intoxicating glory. This jewel-like copper ale begins, as many pumpkin ales do, with a pleasing aroma of cinnamon, cloves, and squashy pumpkins all twisted together in a sweet gift for the air. However, it does not end there – this pumpkin backs up every pie-like promise awakened by it’s perfume. With a solid foundation of pumpkin meat on a biscuity malt, the syrupy feel to this ale swirls the perfect marriage of nutmeg and cinnamon to pumpkin. And, just to add a touch of panache, dashes in a little heat garnering cloves and warms you from inside to out.